What are the most common Badminton injuries? Can they be prevented? Home » What are the most common Badminton injuries? Can they be prevented? Badminton injuries, can they be prevented? Playing Badminton is good for us, it’s fun and it helps to keep us fit but like all sports, injuries will occur sooner or later. So just what are the most common Badminton injuries and how can we prevent or at least minimise the chance of one occurring? Fear not, as I will attempt to answer just those questions having researched this very subject. It may be possible to reduce the chances of suffering Badminton injuries but obviously you can never completely prevent them from happening. That’s life, but when they do happen you will want to have an idea of how long a layoff you may be looking at and what course of treatment are available to you. I will go through the typical treatment scenario’s you can expect but you should always seek medical advice if you believe the injury is serious or not responding to treatment. You will need to rest or it may in fact become more serious of an injury than you first thought. So it’s time to look at what types of Badminton injuries you may suffer from. I’ll go through each of these in a little more detail but first we need to know why some of these injuries occur in the first place. Like help with other areas of the sport? Which Type of Shuttlecock is Best? Of course some a purely down to bad luck anyone can turn or twist an ankle. However ever many will be down to overuse as repeated actions can cause muscle and tissue strain. As we get older the recovery time needed also increases so it’s important to give you body time to recover rather than jumping back into a game before you are ready. All you will achieve is a lengthier lay off. Tennis elbow is a great example of an injury caused largely by a repeated action and one that can really ruin your enjoyment of playing sport. The other main reason you may experience an injury is failing to warm-up before playing. It’s often overlooked by new or amateur players for a few reasons. Firstly who wants to do a warm when all you want to do is smash a few shuttlecocks and enjoy a great game. Another reason is warm-ups tend to be a little boring. The final reason is probably the most difficult to argue against. Time, put simply you have booked the court, maybe you have gone straight from work. You are time limited and just want to get the game started. Probably one of the most common Badminton injuries is caused by the quick change in direction in response to your opponents return. The quick nature of Badminton and Tennis means at some point sooner or later you will roll your ankle. Can you prevent a sprained ankle? You can certainly reduce the chances of it occurring simply be wearing the appropriate footwear. Some people tape their ankles or even wear ankle braces. Providing you haven’t done anything more serious than a sprain, if you believe you have always seek medical attention, then rest and cold pack should help. Keep the weight off as much as you can for a couple of days. One of the worst and potential game changing injuries is often referred to as an ACL. Anterior cruciate ligament injuries at worst used to spell the end of competitive play but thankfully that’s less common these days. Like with an ankle sprain ACL’s are usually the result of twisting quickly when responding to your opponents shot. This tends to take place when the foot stays planted to the floor but your body twists with all the force and weight before you can move your foot. This is actually very easy to do when playing a fast paced game. Sometimes you may get away without needing surgery but in most cases surgery will be required. There’s no doubt this is one of the worst of the potential Badminton injuries a player can have. Can you prevent an ACL injury? You can never totally prevent any injury that’s just the nature of sport and life for that matter. However learning to move your feet in the right way is going to reduce the chances of sustaining an ACL injury. Another way is to ensure you warm-up properly, getting the blood pumping through all the muscles reduces stiffness and inflexible parts of the body and limbs. The best way to understand what has happened to the knee and therefore what needs to be fixed is see the injury and procedure needed to fix it in action. This is when the tendons and bone around the elbow become inflamed causing pain. The pain usually becomes worse when gripping things such as a racket or pen. When around the home you may experience pain when twisting the forearm when turning door handles or opening a jar. If you play a lot of sport such as Badminton or Tennis you will more than likely experience this at some point. It happens fundamentally through repetition and overuse. Tennis elbow is far more common among people aged between 40-60 and both men and women are equally affected. Can you prevent Tennis Elbow? The belief is that gripping the racket too hard in fact causes tennis elbow to occur. So ensure your grip is not too tight. Other things to consider are arm and wrist stretches before and after play. With Tennis elbow the only real cure is time, you need to stop playing Badminton long enough to allow the symptoms to improve. You can help to speed the recovery time up by applying a cold compress, you could use a bag of frozen peas wrapped in a towel and press around the elbow for a few minutes a few times a day. This will certainly ease the pain and should help with the inflammation. In incredibly rare cases a last resort may be surgery. However in the vast majority of cases a full recovery occurs between six months and a year. It all depends on how much rest you give your elbow, don’t start playing when it starts to feel a little easier wait until it feels normal. This is one the Badminton injuries that really needs plenty of rest from playing our favourite sport. Another potentially nasty injury is the Achilles tendon rupture. This is when the tissue that connects the calf muscle to the heel bone tears. One of two things tends to occur, a partial or complete tear of the tendon. Symptoms of Achilles tendon rupture include a snapping or popping sound along with a sharp pain in your heel or calf. Following this the pain may reduce to a dull ache or simply disappear. Other symptoms are swelling around the calf area accompanied by some bruising. You may be unable to put your full weight on it or find yourself unable to climb stairs. The medical advice is clear if you have any of these symptoms leading you to believe you may have rupture your achilles seek medical attention. An ultrasound or MRI will confirm the extent of the injury. It’s another of those potentially game changing Badminton injuries a player can suffer from like the ACL. Can you prevent an Achilies tendon rupture? This is another injury that is best prevented by completing a warm-up prior to play and a warm-down after play. This really depends on whether you have fully or partially ruptured the tendon. In some cases a non-surgical approach may be taken where you wear a brace (plaster cast) or boot on the lower leg for six to eight weeks. In doing so the tendon is kept from moving allowing the healing process to occur. If surgery is deemed necessary the type will depend upon where the exact spot the rupture occurred. Regardless the aim is to stitch the tendon together and allow it to heal. Once healed you will have an increased chance of the tendon rupturing again in the future. Playing sports such as Badminton will certainly place strain on that area. This can occur because of the repeated stress placed on the shoulder during a game of Badminton coming from overhead shots in particular. The muscles around the shoulder area can become strained. Can you prevent shoulder strain and pain? Building up the strength in the shoulder muscles can help to reduce the chance of injury. Rest and a cool pack or ice pack to reduce the inflammation. If you think it may be more serious always seek medical advice. Badminton requires speed, mobility that includes jumping and hitting powerful overhead smash shots. Like most of the injuries listed most can come from the repetitive nature of hitting shots. You may also suffer jarring of the back when landing awkwardly. Neck pain and general stiffness in the lower back are both symptoms of back pain. Can you prevent a back strain? Keeping yourself in shape and ensuring a thorough warm-up and warm down are adhered to can reduce the chance of many injuries occurring. Back pain can come on out of the blue or from a fall but unfortunately rest is still the best cure. It normally takes a few weeks to recover. If you don’t feel any improvement after a couple of weeks it’s probably best to check with your doctor. Keeping active is better than sitting in one position as you can keep the blood moving around the muscles. You can apply either hot or cold compression packs that may give some short-term pain relief. Most athletes and Badminton players will experience a hamstring strain at some point. The hamstring runs down the back of the thigh. Running, twisting and turning, changing direction at speed all places a lot of strain on to the hamstring resulting in either a strain or tear. Badminton is full of fast reacting movements and therefore increases the risk of a hamstring injury occurring. Can you prevent a hamstring strain? Yes and just like many of the other potential injuries it all comes down to that warm-up and warm down session. First off you need to know what kind of hamstring injury you have. Generally it will fall into one of three grades. For the relatively minor grade 1 injury this may take a couple of days to heal, with a grade 2 or 3 you are looking at weeks or even months. If you are concerned that the hamstring is not healing seek medical advice. For recovery plenty of rest is recommended avoiding any physical activity. Use cold packs on your hamstring for around 15 minutes every couple of hours during the day. Never apply ice directly on to the skin. You can use a bag of frozen peas wrapped in a towel. It is also recommended to raise the leg, this can be done with use of pillow. The other area you may experience pain is in the wrist and is likely caused by repetitive strain. Can you prevent a wrist strain? You can do some wrist exercises as part of your warm-up that helps to loosen the muscles and increase the blood flow. Another example of where rest is the best treatment. Adding a cold pack to the area should help ease and reduce inflammation. One of the nasty little Badminton injuries you may encounter. These can occur on both hands and feet and are caused by friction. They are essentially small pockets of fluid that form in the upper layers of the skin. Holding a racket incorrectly can increase the chances of blisters or a badly fitting pair or trainers / sports shoes. Blisters consist of either a clear fluid or blood. Ensure you have comfortable well fitting footwear and your feet will see less blisters. Holding your racket properly will also reduce the chance of hand blisters. Over time the skin on your hands may toughen up reducing the chances of blisters occurring. Ensure you keep them clean to prevent any infection occurring. Try not to burst them as this increases the chance of infection. Within a week they should heal naturally, if you have any concerns seek medical advice. Hopefully this brief look into the most common Badminton injuries you are likely to encounter will provide you with some helpful advice next time you are in the unfortunate and painful position of being injured. Remember to warm-up properly by running around prior to play, this helps the blood to be pumped around the body and loosens the muscles. 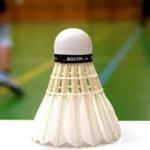 Following your game of Badminton try and fit a warm-down session in, this can help to reduce muscle problems and stiffness. I’ll go through some warm-up drills in my next feature that should give you an idea of what you should be doing. If you have had any Badminton injuries and have any thoughts on the subject I’d love to hear from you.